A spectacular "ring of fire" solar eclipse will darken skies over Africa early Thursday morning (Sept. 1), and people anywhere in the world can watch the event live during a free webcast by the Slooh Community Observatory. The show will feature live telescope shots from Slooh's flagship observatory in the Canary Islands off the west coast of Africa, as well as views from South Africa, Tanzania, Madagascar and tiny Réunion Island. You can watch the webcast at Slooh.com, beginning at 2:45 a.m. EDT Thursday (0645 GMT). "We're in for one heck of a ride as we follow the moon's shadow as it races across the surface of the Earth at over 2,000 mph," Slooh astronomer Paul Cox said in a statement. "We've got a terrific lineup of expert guests on the show — everything from the science of eclipses through to how they affect us psychologically, and a look at how mankind has treated these amazing celestial events in the past." Map showing the path of the Sept. 1, 2016 annular solar eclipse across parts of Africa. The ring effect will be visible only from a narrow band that cuts across the Atlantic Ocean, south-central Africa, parts of Madagascar, Réunion and the southern Indian Ocean. 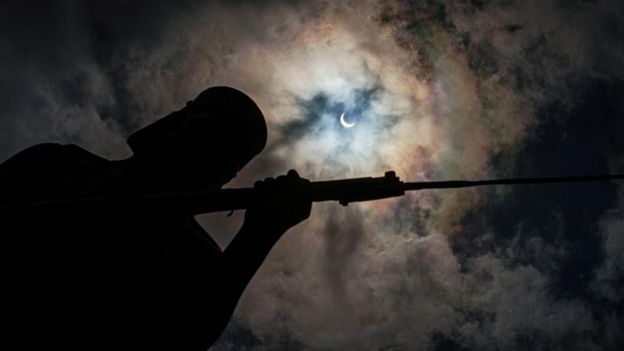 But most of Africa will be treated to a partial eclipse, as will parts of the Arabian Peninsula and slivers of Indonesia and Western Australia. Thursday's event is the second solar eclipse of 2016; the first was a total eclipse on March 8-9, which was visible from Indonesia and the Pacific Ocean region. Another annular solar eclipse, visible from parts of southern Chile, Argentina and Africa, will occur in February 2017. Then, on Aug. 21, 2017, a total solar eclipse will darken skies over a long stretch of the continental United States. Warning: Never look directly at the sun, even during an eclipse, without proper eye protection; serious and permanent vision damage can result. Viewers can ask questions and interact with the host and guests during Thursday's eclipse show by tweeting @Slooh or by joining the http://www.slooh.com. Stargazers in parts of Africa have been treated to a spectacular "ring of fire" in the sky as the sun was almost - but not completely - eclipsed. An annular eclipse happens when the moon is farther away from the Earth than during a total eclipse. The result is a bright circle of sunshine surrounding a dark, shadowy core. The best views were seen in Tanzania, where the event lasted about three minutes. 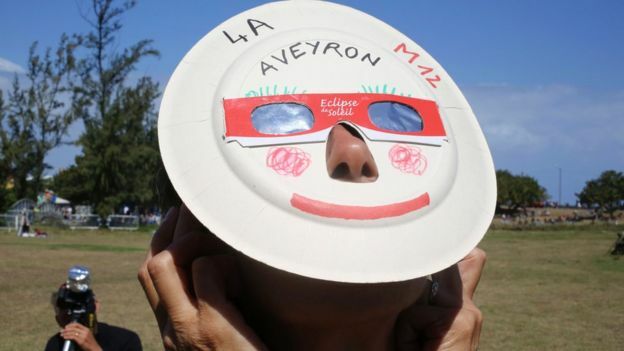 The eclipse could also be viewed in parts of Gabon, Congo-Brazzaville, the Democratic Republic of Congo, Madagascar, and the French Indian Ocean island of La Reunion. The moon does not move in a perfect circle around the earth - instead, its orbit is slightly elliptical. That means the distance of the moon varies between around 225,000-252,000 miles (362,000-405,555 km). When the moon is farther away from the earth, it appears smaller - and does not totally cover the sun's disc during a total eclipse. The result is also known as a "ring of fire" eclipse. The next eclipse is due to take place in February 2017, and can be seen from parts of South America and Africa. A glorious solar eclipse made its way across the African sky early this morning (Sept. 1). As the moon crossed the sun's face, the two created a "ring of fire" that glowed in the sky for about 3 minutes. 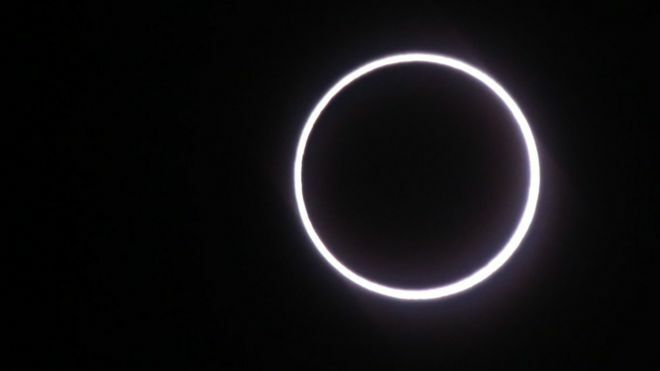 Viewers from Gabon to Tanzania to Madagascar could see the annular solar eclipse, with the moon crossing the sun front and center. 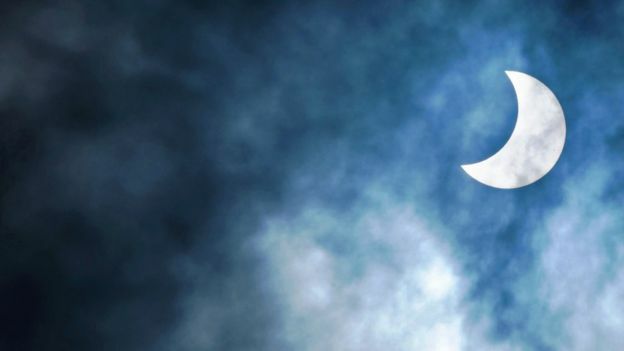 At least a partial solar eclipse, in which the moon appears to have taken a bite out of the sun, was visible from most of Africa. 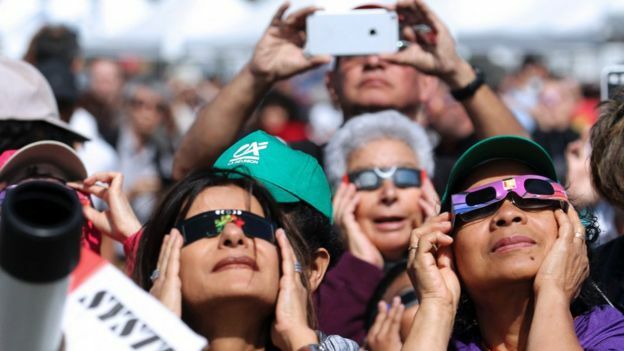 The rest of the world was also able to witness the eclipse from afar, thanks to the Slooh Community Observatory, which broadcast live online views from several telescopes around Africa. Slooh and Weathernews Japan also provided this amazing time-lapse view of the eclipse as seen from Reunion Island, east of Madagascar. Annular solar eclipse of Sept. 1, 2016, as seen from Reunion Island, east of Madagascar. 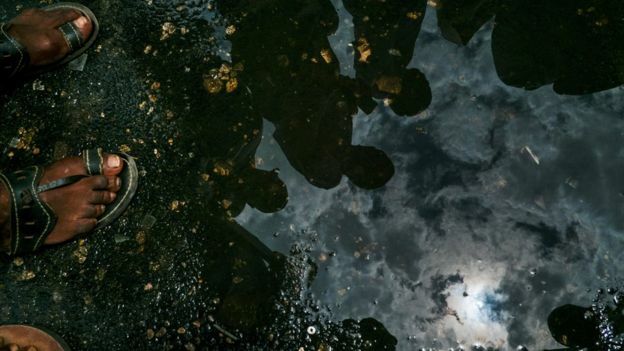 "I was worried initially that a cloudy day here in Arusha was going to stymie my efforts, but it turned out to be easier to capture the images through the clouds," Lever told Space.com in an email. Partial solar eclipse over Arusha, Tanzania, on Sept. 1, 2016. Lever is a safari guide who usually spends his time taking pictures of animals, landscapes and people. 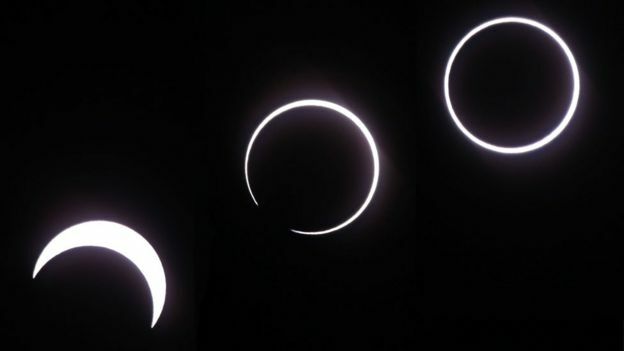 With a decent viewing spot for the eclipse in Tanzania, he decided to take a stab at some astrophotography as well. "I was excited by the challenge of photographing such a unique event," he said. Lever's experience was such a success that he now plans to travel to the United States next year to witness a total solar eclipse. Next year, the "Great American Total Solar Eclipse" will darken skies across much of the continental U.S. on Aug. 21. The "path of totality" stretches from Oregon to South Carolina.